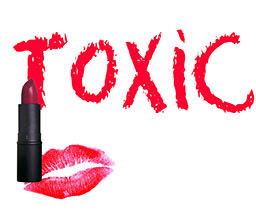 Most people don't realize there are very toxic, cancer causing ingredients in their favorite skincare and beauty products. For those of us who are already aware, it's still hard to know exactly what to avoid because most of the ingredients added to skincare and beauty products these days, are hard to even pronouce or figure out what it means. The FDA does not regulate personal care products ingredients and companies are not required to disclose all the ingredients used to make these products. Therefore, cheap, toxic, cancer causing ingredients have made their way into our skin care and beauty products without us even knowing. Your skin is your largest organ and absorbs anything applied to it, which then enters the bloodstream. So take some time out of your routine to review the back of the ingredient's lists next time you shop for your favorite skincare and beauty products. You may be shocked to find out that some of your favorite products include some of the following ingredients which are bad for your skin, your health and the environment. 1. Fragrance - (Perfum, Scent) Often found a wide range of items from skincare, cleaning, laundry products and air fresheners. Fragrance is a blanket term that can be made up of thousands of different chemicals. Many of them are toxic, cancer forming and come with a long list of side effects ranging from asthma, allergies, immunotoxicity, headaches, vomiting, dizziness to skin discoloration. Phthalates, are another chemical commonly used with fragrances to make them last longer. They are linked to birth defects and are considered a reproductive toxin. They may not be listed in ingredients. 2. Propylene Glycol & Butylene Glycol - Found in cleansers, shampoos, baby wipes, deodorants, hair products, bubble baths to name a few. Also found in windshield wiper fluid! The EPA considers them so toxic they say that skin contact or inhalation can cause brain, liver and kidney abnormalities. In some personal care products these chemicals are used in very high, industrial strength concentrations. 3. DEA, MEA & TEA - Used in shampoos & bubble baths. They are hormone disrupting and form cancer causing nitrates. Restricted in Europe yet legal in the USA, they increase the risk for liver and kidney cancer. 4. Sodium Lauryl Sulfate & Sodium Laureth Sulfate - Otherwise known as (SLS). This toxic ingredient found in almost all drugstore shampoos, conditioners, leave in creams, hair sprays, facial soaps, body soaps and body washes. Strong detergents and degreasers that are found in over 90% of foaming personal care products. SLS is linked to skin irritation, eye irritation, rashes and hair loss. Animal studies show eye damage (especially to young), immune system damage and death. Can create nitrosamines which are carcinogenic. Once absorbed into the skin, can also be retained in your organs for a lifetime. 5. DMDM & Urea - Found in a wide variety of personal care products. It is a preservative that releases formaldehyde which causes allergies, chest pain, fatigue, ear infections, immune dysfunction, asthma, heart palpitations, cancer and more. 6. Polyethylene Glycol - (PEG) - Often found in almost any skincare product. Petroleum ingredient that is carcinogenic and dehydrates your skin. Increases signs of skin aging and leaves your skin vulnerable to bacteria and disease. 7. Parabens - Often found in shampoos, creams & lotions. There are many different forms of parabens which are used as a preservative in many skincare products. Avoid them ALL. They are strong hormone disruptors and have been directly linked to breast cancer and heart problems. Often listed as Methylparaben, Probylparaben, Butylparaben, Ethylparaben & Benezylparaben. 8. FD & C Color - Found in makeup, lipsticks, creams, hair products and more. Synthetic pigments from coal that deposit toxins into the skin. Some colors can even deplete oxygen in the body and cause death. Animal studies have shown almost all of them to be cancer causing. 9. Mineral Oil (Petroleum by-product) - Often found in Baby Products (Baby Oil), Vaseline, Lip Products & Moisturizers. It coats the skin like a plastic wrap, clogging pores, causing acne and trapping in toxins. 10. Isopropyl alcohol (Petroleum by product) - Found commonly in cleansers, toners, creams and hair and nail products. It dries and irritates skin, stripping its moisture and immune barrier. When in doubt, just shop for products that are clearly labeled, "Organic or All Natural" and take a moment to review the back of labels on the ingredients list and make sure they don't have any of the toxic 10 listed above. You especially want to avoid Parabens, Sodium Laureth Sulphate, DEA, MEA, TEA, Dyes or Parfumes. Below is a list of some of my favorite safter alternatives. Shower GelA great natural body wash to try is 100% Pure Shower Gel . All 100% Pure products are completely chemcial free and don't contain any harsh detergents (like sulfates) that can strip, irritate, or dehydrate your skin. They also contain no artificial fragrances, synthetic chemicals, alcohol or any other toxins. You can also find some good chemical free body washes and soaps at Walmart and Target, just make sure you read the ingredients list. If your looking a general chemical free natural body and facial soap, a great one to try is Kiss My Face. They have several soaps to choose from. Their chemical free, fragrance free and will leave your skin feeling clean, smooth and soft. I use the olive oil soap with green tea and find it's great for oily/acne prone skin. A great all natural hair product line to try is WEN Healthy Haircare System.What sets WEN apart is its cleansing conditioner, a single-step process that cleanses and conditions the hair simultaneously leaving hair feeling super shiny, soft and smooth! WEN is my top favorite hair product and is a must have product for the beauty and fashion industries as well as many A-list celebrities. All the cleansers include natural ingredients and contain no parabens, sodium laurel sulfate or other damaging detergents found in shampoos that strip and dry your hair out. WEN also offers all natural Styling Creme , Re-Moist Hydrating Masks andBath, Body & Hair Oils . You can get beautiful, younger, glowing skin by using organic, unrefined shea butter as a daily facial moistuizer. This type of Shea butter in it's purest form, won't cause breakouts, is great for all skin types and will leave your skin feeling ultra silky, smooth and soft. It's key to buy organic, unrefined shea butter because once it's processed, it loses all the beneficial nurtients and will have little or no effect on the skin. Shea butter is also known as the best natural moisturizer on the planet! A great one to try is L'Occitane Organic Shea Butter. When purchasing make-up, you should avoid most department store brands and opt for mineral make-up brands instead. A great mineral make-up brand to start with is Pur Minerals, http://www.purminerals.com/. They are famous for their award winning 4-1 Pressed Mineral powder which has won all kinds of beauty awards and been branded the #1 Pressed Mineral powder by beauty editors and mineral make-up fans alike. They have an excellent line of mineral make-up and skincare. Another great natural, organic based skincare and make-up line is Origins. They offer both award winning, organic, natural skincare and chemical free make-up. Recently they came out with a new healthy powder called Origins Multi-grain Make-up. It's fortified with organic ingredients, vitamins and minerals and has an SPF of 14 and is great for your skin. You can also find them at Dillards or Macy's. There are some great baby and kid friendly body and hair wash products that are good for your baby and / or child that are completely chemical free. A great one for babies is Avalon Organics. They are a trusted organic skincare brand and have the best reviews. A great one to try is Avalon Organics Gentle Tear-Free Shampoo and Body Wash and Nourishing Baby Lotion . A great one for the kids is 100% Pure Organic Kids 2 in 1 Body Wash and Shampoo. Their 2-1 body washes are 100% Natural, very gentle formula and don't contain any synthetic chemicals, harsh detergents, artificial fragrances, chemical preservatives or any other toxins that can harm your young. They are truely chemical free and is 100% natural and vegan. They offer duo hair and body washes in Yummy Ice Cream Vanilla and Mint Chocolate Chip . Or if the kids prefer to use plain bar soap, you can use all natural Kiss My Face. i like this post, very informative. I really like this post aside from the fact that this is informative. Continue posting this kind of stuff. I agree, VERY informative post! I love posts that teach me something new. I'm definitely going to be eyeing the back of those labels.